Prepare all vegetables. Place vegetables in a roasting pan with the mushroom caps and green onions. Season vegetables generously with salt and pepper, and toss with the Basil Oil and Ginger Fig or Roasted Garlic Balsamic. 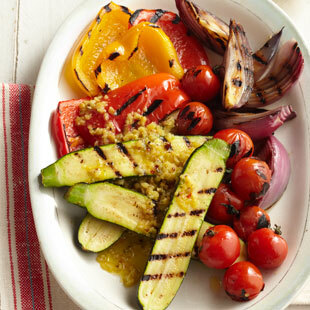 Place vegetables, cut side down, on the hot BBQ and cook for a couple of minutes on each side, or until tender and nicely marked by the grill.